Against the backdrop of several incidents of Syrian fighting spilling across the border to the Golan Heights, Defense Minister Moshe Ya'alon announced Tuesday that Israel has no intention to interfere in the ongoing Syrian civil war. 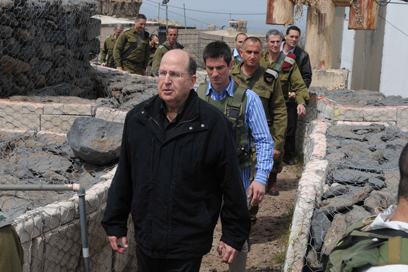 "When the war damages our interests – we'll respond," Ya'alon said. Recently several wounded Syrians crossed the border and received medical treatment in Israel, and some incidents of mortar and gun fire from across the border were also recorded. Ya'alon's statement was given while the minister was touring an IDF outpost near the Syrian border, where he was briefed regarding recent happenings in the sector including a rocket launch toward a Syrian post which fired at the Israeli side. "I arrived at the Golan Heights in order to follow closely the developments across the border where a bloody civil war has been going on for the last two years," Ya'alon said. "Recently the war has claimed the lives of thousands, but we won't interfere as long as our interests are not damaged." Ya'alon added that a threat may arise out of "weapon smuggling to irresponsible elements such as Hezbollah in Lebanon or Syrian terror groups. We have acted against them in the past and we'll continue to do so in the future. "The IDF is keeping the Golan Heights calm so that citizens can travel around here as they did over the last holiday." See all talkbacks "Ya'alon on Syria: When it damages our interests - we'll respond"